Osaka University research has identified an immune cell that promotes growth of cells supporting neurons in the mouse embryo brain. Neurons are specialized nervous cells that communicate using electrical signals. They multiply and spread along wire-like projections called axons. In order to conduct electrical signals, axons must have in-tact myelin, a fatty substance which surrounds an axon much like sheathing that surrounds electric wires. Several neurological disorders, including autism and schizophrenia, may be partially due to myelin sheathing failing to completely insulate axons growing in the early embryo. In a study published in Nature Neuroscience, researchers now add an unexpected piece to the puzzle of embryo development. They reveal how immune cells play also play a key role in helping myelin surround newly branching neurons. T and B cells are vital players in the immune system as they circulate through the body to find infectious agents and mount a protective attack against them. These cells spend most of their time traveling the bloodstream and the lymph nodes — but are considered blocked from accessing the brain. "The central nervous system is protected from pathogens by a highly selective barrier which keeps the circulatory system physically separated from the brain. It's generally believed that this barrier also excludes immune cells from the brain. Our study suggests otherwise. We found that a certain type of B cell is quite abundant in the ventricles, meninges, and choroid plexus in brains of young mice. Even more surprising, these cells appear to stimulate axon myelination in surrounding neurons." Shogo Tanabe PhD, World Premier International Immunology Frontier Research Center, Osaka University, Osaka, Japan and lead author. Neurons don't produce their own myelin. Instead, support cells called oligodendrocytes make the myelin sheath that wraps around an axon. The Osaka team discovered B immune cells, called B-1a cells, ensure the supply of oligodendrocytes in the developing brain is enough to support myelination of developing axons. Shogo Tanabe PhD: "We experimentally depleted B cells from the brains of young mice and saw oligodendrocyte numbers drop significantly. It turns out that so-called natural antibodies secreted by B-1a cells induce the precurosor cells to oligodendrocytes to proliferate. These antibodies, typically involved in immune surveillance, in this case promote myelination of axons." 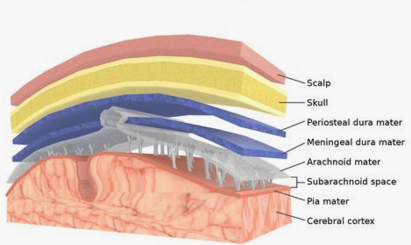 Recent studies show that T cells can occupy the meninges (3 membranes [2 dark blue and 1 in gray] that line the skull and vertebra to enclose the brain and spinal cord.) — and affect learning and memory. However, this is the first study implicating B cells in myelin production during embryo development. This may have broad implications for diseases rising from defects in early neuron growth. "Prior work has indirectly hinted at a role for B cells in neurodevelopmental disorders," says lead investigator Toshihide Yamashita. "Our findings provide direct evidence that B cells reside in the mouse neonatal brain and promote both oligodendrocyte proliferation and neuron myelination. This suggests to us that B cell dysfunction in early development may contribute to later mental disorders, a possibility that we believe deserves further exploration." During brain development, the immune system mediates neurogenesis, gliogenesis and synapse formation. However, it remains unclear whether peripheral lymphocytes contribute to brain development. Here we identified the subtypes of lymphocytes that are present in neonatal mouse brains and investigated their functions. We found that B-1a cells, a subtype of B cells, were abundant in the neonatal mouse brain and infiltrated into the brain in a CXCL13–CXCR5-dependent manner. 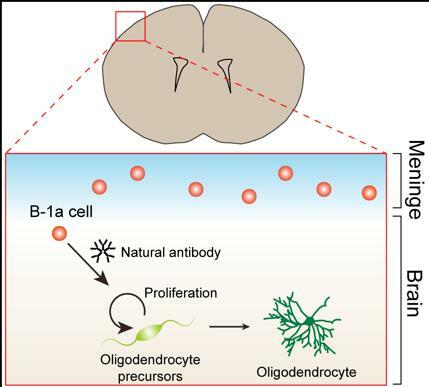 B-1a cells promoted the proliferation of oligodendrocyte-precursor cells (OPCs) in vitro, and depletion of B-1a cells from developing brains resulted in a reduction of numbers of OPCs and mature oligodendrocytes. Furthermore, neutralizing Fc?/?R, the receptor for the Fc region of IgM secreted by B-1a cells, inhibited OPC proliferation and reduced the proportion of myelinated axons in neonatal mouse brains. Our results demonstrate that B-1a cells infiltrate into the brain and contribute to oligodendrogenesis and myelination by promoting OPC proliferation via IgM–Fc?/?R signaling. Diagram of B-1a cells in meningeal space where they secrete natural antibodies to promote proliferation of oligodendrocyte precorsor cells, and support brain development. Image: Osaka University.